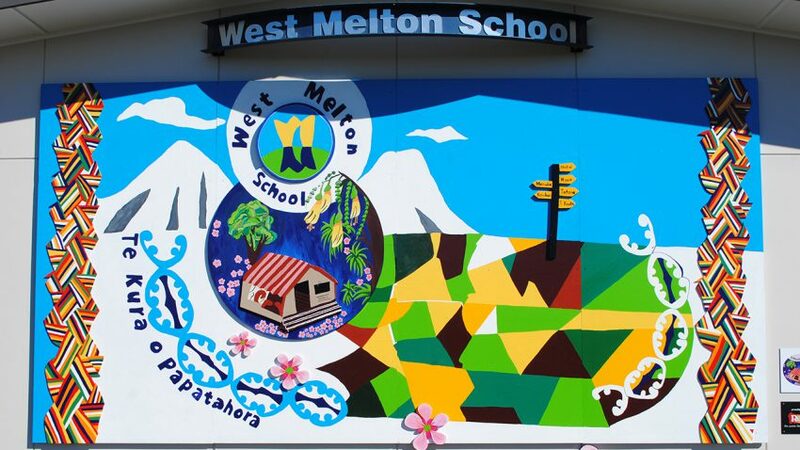 On Friday, March 29, West Melton School unveiled their new school mural, student-led and designed and painted by students for the school and community. The school’s promotions and sports administrator Rita Spadoni said students learnt about murals and had the opportunity to submit a design. The cultural committee received many submissions, she said, and four with special merit were selected for the presentation to the Board of Trustees. “Initially, the mural was going to incorporate a patiki (flounder) kowhaiwhai pattern, but after consultation with local iwi, it was decided that an original adaptation of the koru would be more appropriate.” All learners who submitted designs were treated to an afternoon at the Christchurch Art Gallery to participate in their Wall to Wall exhibition in August. Many students throughout the school contributed to the mural. Not only did students paint the mural, but also many staff and some of the community painted the two colourful weavings, which combine the colours of their whanau: Hill, Trickett, Ross, Langdale, Selwyn and Newton.